NetworkArts’ primary partner is schools, but it has many partnerships with public museums, libraries, community centers, housing projects, recreation centers, nursing homes, and city gardens. With the innovative ideas and strong support of these organizations, NetworkArts has been able to touch the lives of approximately 50,000 students with an approach that stays with the children long after they leave the program. 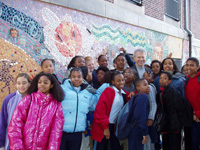 For over 15 years, organizations such as these have teamed with NetworkArts to use the creation of mosaics as an educational tool. Interested in making a difference in the lives of children? Don’t delay — contact us for more information on how to be a partner or volunteer today! NetworkArts also engages in collaborative efforts with other area non-profit organizations engaged in education and the arts.